Granite Gear's backpack profile is tall and slim, and it's not just because it looks cool. It allows ergonomic packing of a laptop, books, and gear without smashing your PB and J sandwich! 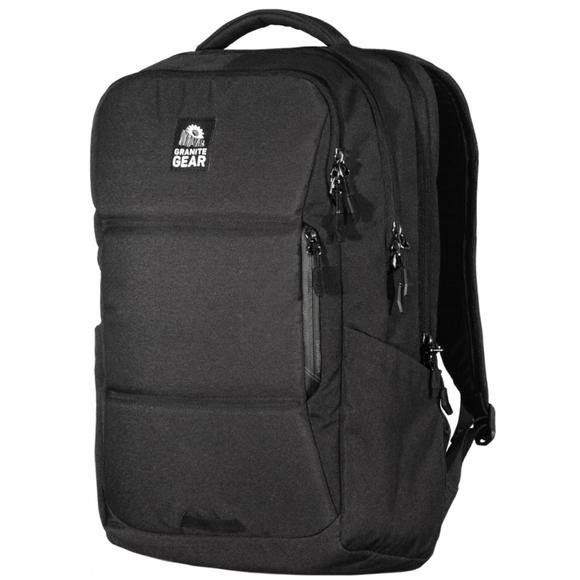 It also keeps the weight of the pack closer to the carrier's back, providing better center of gravity. Granite Gear &apos;s backpack profile is tall and slim, and it&apos;s not just because it looks cool. It allows ergonomic packing of a laptop, books, and gear without smashing your PB and J sandwich! It also keeps the weight of the pack closer to the carrier&apos;s back, providing better center of gravity. Durable Repelaweave fabrics to shelter your gear from the elements. Abrasion and extreme water resistant Tarpualite fabric provides a bottom shell of defense. Durable water-repellent zippers and extreme water resistant valuables pocket zipper. Supreme Tricot-lined laptop/tablet defense keeps your devices safe. Tricot-Lined electronics pockets provides care for your gadgets. Ergonomic, raised foam back panel with lumbar support. Breathable, load absorbing shoulder harness. Load stabilizing sternum strap. Load bearing waist belt. Measurements 19" x 11" x 7"